7th & 8th Grade New England Math League Competition! 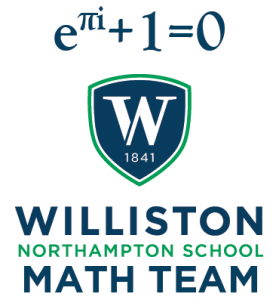 The 7th & 8th grade level of the New England Math League competition will be held on Tuesday, 2/28 from 3:30 to 4:30 in WB! Any student in 7th or 8th grade is welcome to compete! Please sign up using this online form by 2/25 @ 3pm. The league results were just updated to include round 4 of the New England Math League and with our running score of 95 we are holding strong at 28th out of 125 teams! The 5th round of the New England Math League will be held on Monday, 2/13 from 2:35 to 3:35 in Schoolhouse 25. Anyone at any level of mathematics is welcome to participate! You may use a calculator, the competition lasts 30 minutes, and you must begin by 3:10. Complete league results can be viewed online right here. Overall Williston standings, broken down by competitor, can be found on the results page. Congratulations to Steven Wang for being in 6th place (out of all competitors league-wide!) with 23 total points!